I came across the recipe for Paneer Kheer/Paneer Payasam in a Tamil Magazine. The original recipe required for pressure cooking paneer, so I modified it. It was a hit with my husband the first time itself, in spite of the fact that he is not a big fan of paneer. The kheer tasted like Basundhi, because of the the grated paneer. So I modified my recipe again, by increasing the quantity of paneer so that it would have the exact texture of Basundi. This is my mother-in-law’s favorite too, so she asked me to make this for Ugadi. 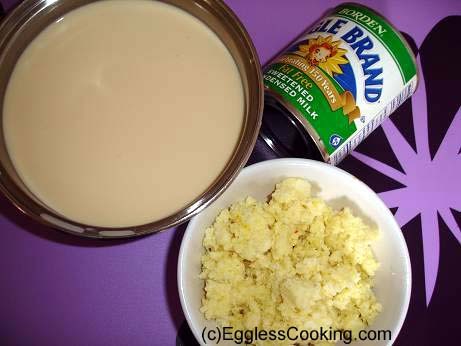 This time I made another modification, I used Evaporated Milk instead of regular milk. Wow! It was the best ever. 4. Sugar – couple teaspoons to mix it with the grated paneer. 5. 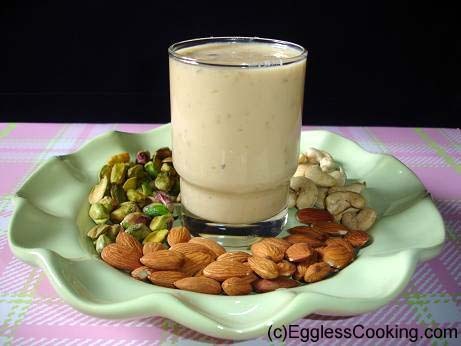 MTR Badam (Almond) Mix – This is optional. (updated: a couple of teaspoons is enough) The original recipe only called for sugar to be mixed with the paneer, I thought mixing the badam mix would give a rich flavor. 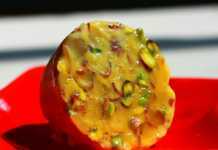 If you don’t have that in hand you can always use saffron strands and the other regular garnishing and flavoring like cardamom powder, pistachios etc. 1. Grate 200 gm of paneer (half of the pack), add sugar and the Badam powder and mix everything thoroughly. 2. In a heavy bottomed vessel (this one is very important) add both the cans of milk and let it boil. The color of evaporated milk was so good, I strongly feel that Pal (Milk) Payasam would taste excellent if made with evaporated milk instead of regular milk. 3. Once it starts boiling add half the can of sweetened condensed milk and let it boil. 4. After a couple of minutes add the grated paneer and let it cook together with the milk. After sometime the paneer would have dissolved, not entirely though. You can either stop at this stage for paneer kheer or continue to take it to the next level. 5. If you decide to go with basundhi, grate the remaining paneer (depending upon how much you want or the texture you want. I used another 1/4th) directly into the vessel and let it simmer for just 3-5 minutes. Switch off the heat and it will thicken by itself and it will have the exact texture of basundhi and will taste exactly like basundhi. I had the pistachios and almond mixture I prepared for baklava, so I mixed that one too. Needless to say it was very very very delicious! If you decide to make basundi, you can add 3/4ths of the paneer straight away while the condensed milk mixture is boiling. I asked my friend to try this method and she told me that it came out very well. Keep it on the stove for another 3-5 minutes and turn it off. The kheer will start to thicken and you will get the basundi texture. Can I use ricotta cheese instead of paneer? This is a very rich and heavy kheer. So you should be able to get about 10-12 servings easily. Or even more. Thanks for the heads up Marchy, we have updated it now. if yes how much milk i need? You can Roopa. If you are patient enough use 3-4 cups of 1% milk and boil it until it reduces to half the quantity. By doing this we can get a thicker/richer kheer. Or else increase the quantity of paneer and use around 2 cups of milk. Any idea how many servings this makes? I have made it before but dont remember. Can I substitute Khoa for Paneer? I dont have Paneer and dont want to go to the store to buy it! It has to be paneer, Vijaya. Can I try this with homemade panneer? I have the paneer only in fresh crumbled form. If so, can you please let me know how much I can use in terms of cup measurement? I’m sure it would turn out good as well with fresh paneer. I think about 1 cup of paneer should be fine. The quantity depends upon how you want the consistency to be. If you want it to be thick like basundhi then increase it or reduce it accordingly. Thanks and sorry for spamming with links – you can delete it after you view the post. Thanks! I made this a few days back for a party and decided to blog about it. Please check out my blog when you have time. Thanks for a wonderful recipe – my guests loved it and so did I! I tried your Paneer Basundi recipe abt a week ago (sorry couldn’t update same day) & it was such a huge hit.Occassion was a potluck. All my friends liked it very much.My husband was very proud of me.Thanks a ton for this wonderful recipe. Tried your Basundhi today. Came out delicious. Never expected the taste to be real yummy.It was awesme. I prepared it today as a surprise for my hubby.I knw for sure..he would luv it. How long will the basundhi stay good in the fridge? want to knw the storage life. You’re welcome Rohini. Usually we have it for 3 days in the fridge. It gets over by then. if you ever try it. I just mailed you via the contact me but i have no idea when you will see it.Is it ok to use ricotta cheese instead of paneer ? And how much ? Hi Anu, I’m not sure about it because I’ve not tried it. I think the ricotta cheese would either dissolve or curdle when added to the hot milk. I think only with paneer you would get the correct texture. Very nice recipe…I saw your comment about pal payasam…I always use evaporated milk for the same …and it does comes out welll….do try. 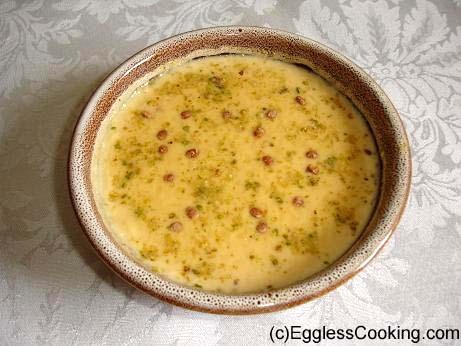 Also try using evaporated milk instead of cream in north indian recipes…. Thanks Swarna. Yes I did start using evaporated milk for pal payasam and sakkara pongal as well and both taste so good. Thanks for the tip about using it instead of cream. I’ll try it. 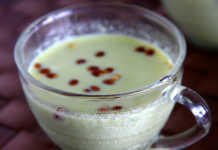 I tried this basundi.. and it was major hit da.. Thanks for this lovely recipe.. Thanks for the feedback Arthi. I donno when u made all this, but know wat? I have becoema great fan of urs madhu!! !i have clicked open all of ur photos jus to see how fantastic they all look!! !do u have a fan club? nominate me as the president please!!! Hmmmm I did not check. I’m sure i made some mistake. 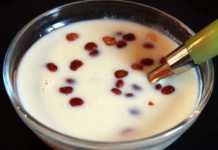 Till the panner payasam stage it looked very good but when i tasted it there was a little tangy taste. does that mean the paneer was expired? There is water above the thickened mix! is it spoilt? Sanchitha, I’m very sorry about it. Mine looked nice and thick exactly like regular Basundi itself. I’m not sure what happened exactly, but maybe the mix got curdled. It’s just a guess though. I have tried this Basundhi a couple of times before posting here and after that also and did not have any problem at all and so did my friend too. Did you check the expiry date of milk/paneer? I tried the basundi… I dunno if I did it right but After I added the remaining paneer to the payasam and let it simmer for 4 minutes. When i came back and saw it looked like the whole thing had gotten spoilt. I’m not sure if thts how its supposed to look. @Priya: Welcome to my blog. Thank you for taking the time to leave your valuble comments. Do try it, you won’t be disappointed.